In the midst of the holiday eating and drinking season, I've been thinking about some of the signs that the local/sustainable food movement's emphasis on health and virtue may be starting to include more things that may be good without necessarily being quite so good for us. The notion of "virtuous foods"--those that are seen to be morally good--comes from food philosopher Lisa Heldke. Drawing on this idea, Amy Trubek, in a provocative article in a recent Radical History Review issue on "Radical Foodways," points out that "When it comes to food in the United States, our moral compass veers quickly toward the puritanical." Others--for example, Warren Belasco in his great book Appetite for Change (Cornell University Press, 1989, republished and updated in 2006)--have pointed to a moralizing strain in the search for an American "counter-cuisine" that can undo the ills of our industrialized food system (and society) and set us on the path to a better life. Trubek notes that food reformers often look to the agricultural past for inspiration, invoking a preindustrial Garden of Eden in sometimes very direct ways (for example, in the brand name at left) and extolling the strengths of peasant farming (as Albert Howard did in the organic food movement, or Rudolph Steiner in biodynamic agriculture) or small-scale yeoman farming (as Wendell Berry and many other American agrarianists have tended to do). All well and good, says Trubek, but she sees this as a highly selective use of the past, which excludes many of the hardships, complexities, and contradictions of pre-industrial farming (for example, the use of unfree labor in many places). 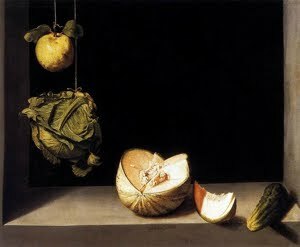 She calls for "a less puritanical and perhaps more ecumenical ethos" based on aesthetics and quality as well as notions about healthfulness, but worries that, "We can’t quite figure out a concept of good food that can transcend an assumed opposite, bad food... The ideal of eating food that is pleasurable, in sensory and social terms, remains elusive." I think Trubek is selling short the burgeoning creativity of the local food movement, which is already exploiting the interesting dissonance between "good for you" and just "good." Here are three examples that come immediately to my mind. (1) When I started doing my preliminary research for the Martin Van Buren Ethnographic Landscape Study, the national park gave me a list of many of the nearby small farms that were producing artisanal foods. One that immediately caught my eye was the orchard just north of Kinderhook that makes--in addition to arguably the best cider donuts anywhere--applejack, brandy, and vodka using its own apples. Golden Harvest Farm has spun off Harvest Spirits, one of many small-scale distilleries around the region. (2) These distilleries are in many ways following the path already laid down by the micro-breweries that have sprung up everywhere in the past 25 years. I remember reading Stephen Morris's The Great Beer Trek (Penguin, 1984) shortly after I moved to the U.S., and being saddened by the account of one regional brewery after another closing down as a few giant corporations continued to consolidate their stranglehold on the American beer industry. The same year the book came out, though, the Boston Brewing Company began making Samuel Adams beer, and the turnaround was well underway by the end of the decade. The micro-brewery renaissance prefigured the local-food movement, touting local and regional variations, small scale, and freshness as appealing alternatives to bland and industrialized products shipped from across the country. A completely revised and updated version of Morris's book is due out in 2012, turning what had been a jeremiad into a chronicle of local and regional industry reborn. "No Farms, No Food" bumper stickers have gotten pretty commonplace over the past few years, but this fall I've occasionally seen one around western Mass. that says "No Farms, No Beer." Turns out it's advertising Preservation Ale, a limited-edition beer brewed by the Berkshire Brewing Company this fall as a fundraiser for the Franklin Land Trust. The links among local food, history, and farmland preservation don't get much more explicit than that! (3) And the Arcadia Center, a social-justice-oriented farming operation based on one of George Washington's farms, has fully embraced the good food/bad food binary with its "Vices that Made Virginia" fundraiser, which features locally-produced bourbon, oysters, and cigars. An article about the first event, in 2010, describes a menu that makes my mouth water even after all the good food I ate myself yesterday: oysters fried, roasted, deviled, and on the half shell, a roasted pig, beer-braised bison short ribs, cider-glazed duck, pork jowls, Brunswick stew, Virginia ham carbonara, bacon and corn spoon bread, regional artisanal cheeses, brûléed pears, and more. This is a feast that refuses the dichotomy between virtue and its opposite and reflects the complexity of a real, living food system. I'd be interested to hear of other examples of "good bad foods" being produced on a local or regional scale. Did any of you discover any new ones over the holidays? Lisa Heldke, “Down-Home Global Cooking: Why Cosmopolitanism versus Localism Is a False Dichotomy, and How Our Food Can Show Us the Way to a Third Option,” in The Philosophy of Food, ed. David Kaplan (Berkeley: University of California Press, February 2012). Amy B. Trubek, "Radical Taste: What is Our Future?" in Radical History Review Spring 2011 (110), 193. Trubek, "Radical Taste," 194, 195. Patrons of husbandry: Are non-profits the new gentleman farmers? One of the things that I learned very quickly in my research for the Martin Van Buren National Historic Site Ethnographic Landscape Study that I've been working on for the past couple of years is that it's seldom, if ever, been easy to make a living farming, particularly since the emergence of a market-oriented society in the early nineteenth century. And one of the big revelations for me during the study was just how long ago people in the American northeast started bemoaning the decline of agriculture and trying to revitalize, reform, and preserve rural agricultural places and communities. When Martin Van Buren moved back to his native town of Kinderhook after losing his bid for Presidential reelection in 1840, there was an element of this revitalization urge in the way he approached the old Dutch farm property that he settled down on. He wanted to help solidify and maintain the farming patterns he had grown up with (although he was the son of a village tavern-owner rather than a farm boy himself). The key point is that he had the wealth to invest in trying to make the farm profitable, in a time when acquiring enough good farmland to make a prosperous living was already beginning to be beyond the reach of less well-capitalized Americans in the northeast. It's not exactly clear how profitable Van Buren's farm actually ever was, but that's another key point: he could farm in ways that he believed to be ecologically and morally sound, without having to worry over-much about how this affected his bottom line in an increasingly commercialized farming economy. Gentleman farmers were often among the experimenters and innovators as agriculture became more and more industrialized and commoditized. Sometimes they were pushing for modernization, but just as often they were trying to conserve older ways of life or--often paradoxically--trying to combine the two. Much of the wealth that created model farm estates in the nineteenth and twentieth centuries actually originated with industry. Edwin Severin Clark, who turned James Fenimore Cooper's old farmstead into a state-of-the-art dairy operation in 1918, was a Singer Sewing Machine heir. In Vermont, the Vanderbilt fortune was largely behind the creation of Shelburne Farms out of a patchwork of 30 small properties into a 3,800-acre model agricultural estate by the turn of the twentieth century, while a succession of wealthy conservationists--George Perkins Marsh in the mid-nineteenth century, Frederick Billings in the later century, and Laurance and Mary Rockefeller in the mid-twentieth--left their mark on the farm and forest property that is now Marsh-Billings-Rockefeller National Historical Park in Woodstock. In Ohio, best-selling writer Louis Bromfield started a grass-based operation at Malabar Farm in 1938 and produced fiction and non-fiction that popularized his ideas widely. One of the most interesting legacies of this history of gentleman-farming is that these model farms have very often been preserved as historic sites, moving from the sort-of-for-profit to the not-for-profit realm. The farm estates of many of Martin Van Buren's political predecessors and contemporaries--George Washington's Mount Vernon, Thomas Jefferson's Monticello, Andrew Jackson's Hermitage--are among the best-known American historic sites, with Mount Vernon arguably the progenitor of the preservation movement in the U.S. Clark's Cooperstown dairy farm became the Farmers' Museum in 1944, while Malabar Farm became an Ohio state park and Shelburne Farms was reconfigured as an educational center in 1972. The non-profit incarnations of these farms often preserve prime farmland, promote the virtues of local and regional agriculture and products, and are involved in educational endeavors, all things that also distinguished the original model estates. But as some of these sites begin to connect with the local and sustainable food movements, another similarity is arising: like the older gentleman farmers, the non-profit historic sites are engaging more directly with the contemporary agricultural economy, but without having to stand or fall on their ability to survive in the for-profit marketplace. I argued in last week's post that surviving "for real" is an important test of a farm operation's viability, and that farms at historic sites that remain entirely within the educational, representational, or social service realms aren't really challenging or changing the conditions of the farm sector overall. But the question is far from a simple one. It's also possible to envision these non-profits as a new version of the old gentleman-farmers, holding desirable farmland in trust, willing and able to support experimental or philanthropic ventures that respond to the problems caused by purely commercial approaches to agriculture. Might Martin Van Buren NHS be a new version of Martin Van Buren himself? A big question there, of course, is whether historic sites' own sources of support--mostly public funding of various kinds--will be robust enough for them to play this role of patronage within local and regional food networks. If public funding continues to dry up--if the gentleman-farmers lose their fortunes--agriculture may become more necessity than philanthropy at these preserved places. Or it may be that public funding will follow innovative, risk-taking projects that involve food production, rather than the kinds of more traditional exhibitry and programming that have been the bread and butter of public history. In either case, looking at the history of these historic farm sites, as I hope to be doing in future posts, may point us in some useful directions. Few of them are simply "ordinary" farms; there's a lineage of elite patronage and reform there that we should pay attention to in this new era of reform and reinvention of the food system. I'd be interested to hear of other gentleman-farmer examples, especially those whose properties have entered the preservation realm and perhaps the current agricultural economy as well. How do we know when farming is "for real"? I launched the blog last week in a fit of somewhat irrational exuberance, without having all of my initial examples listed and organized on the links page. Finishing that task this week pushed me to think through how I’m defining “working farm” and “historic site,” the two sides of the equation that I’m planning to focus on here. And it reinforced my initial sense that there are lots of things going on at the borders of these two things, but still relatively few that are actually finding ways to merge them. When I think about what makes a “working farm,” I’m looking for something that is directly involved in selling food that people will eat in their everyday modern lives (not just apple butter or maple syrup that is made as part of a demonstration and perhaps sold as essentially a souvenir, but something that people would buy as part of their food shopping). This definition knocks off the list a number of farming projects at historic sites that seem, on the surface, to be worth including. For example, at Booker T. Washington National Monument, the local Rotary Club helps distribute food from the national park’s Heirloom Garden to low-income residents of the area. At Carroll’s Hundred in Baltimore, the “Black Damask Project” involves urban youth who have helped replant a 1760s orchard as a way to help them gain a sense of community history. These kinds of projects, while they utilize historic places, foods, and methods in often exciting and creative ways, don’t rely on the proceeds of the food they grow to support themselves. They’re more oriented toward education, demonstration, or providing a service, rather than selling a product. There are certainly lots of farms and farmers in the sustainable/local food movement who are interested in more than just making money. To give just one example, my friends Deb Habib and Ricky Baruc at Seeds of Solidarity in Orange, Mass., blend farming, education, environmental awareness, and social change on every level of their operation. (Those are Ricky's greens in the photo at the top of the page.) But entering into the real-life agricultural marketplace makes an important statement that farming is about real-life food production, and that it’s not enough just to show how food can be grown, cooked, and consumed in ways that challenge the dominant industrialized food system--we also have to address the marketing and distribution pieces of the puzzle as well. Finding a customer base and a distribution network becomes a test of a farm’s vision and viability, and argues for the realistic possibility of small-scale farms surviving without heavy subsidy of one kind or another. 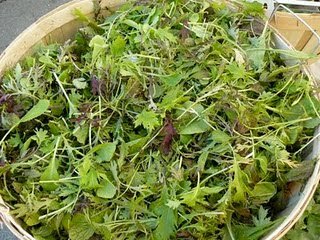 So the various historic sites that host community gardens (for example, Fort Dupont in Washington, DC or the massive community gardens at Gateway National Recreation Area in New York City) didn’t make it onto my links page, because those growers are producing food for their own use rather than selling it to others. And for a different set of reasons, historic sites where representing the past is the underlying goal also didn’t get onto the list. A recent issue of Organic Gardening features an article about how Colonial Williamsburg recreates colonial-era food gardening techniques and crops. But the emphasis at CW is on depicting the past as accurately as possible--what Richard Handler and Eric Gable have called “mimetic realism”--rather than on farming in a way that directly engages the present. That dividing line shows up in a discussion of how the site’s growers deal with pests that hadn’t taken up residence in North America until after the eighteenth century. “We have to deal authentically with inauthentic pests,” one of the gardeners is quoted as saying. This is very different from the approach of Tillers International, which has created a “Reinvention Lab” to experiment with ways in which historic methods and tools might make “low-capital” farming more feasible for farmers around the world. So that’s how I chose the examples on these links pages. Can you think of other examples that might test or challenge my definitions here? Should I be including anything that I’ve decided to keep off the list? And I promised to give a shout-out to the first ten of my Facebook friends who signed up to receive these blog posts via email. Here are the top ten—but I’m very grateful to all who’ve signed up so far! Thanks to Carrie Kourkoumelis, Pam Donnelly, Craig Stockwell, Susan Sawyer, Maureen Riendeau, Stacie Gay, Amahl Bishara, Sue Cloutier, Linda Ruel Flynn, and Leah Mason. When I finished my dissertation in 2003 and was casting around for a new research project, I thought I would study the ways that dairy farming has been used to create an image for Vermont as a tourist destination. Although I hadn’t articulated it clearly for myself at that point, I think I was looking for some way to investigate places where the “real” business of agriculture overlapped with the expanding realm of agritourism, all out of some vague sense that this was something that increasingly mattered as the consequences of our mobile, industrialized, petroleum-based food industry (and society) became clearer and more distressing to contemplate. I did some preliminary exploration, read enough about American agricultural history to recognize that it was far more complicated than I’d ever imagined, and then got too busy with other things to pursue the full-scale ethnographic project I’d had in mind. Six years later, I was handed a wonderful chance to return to a subject that had only gotten more interesting and urgent in the meantime. Over the past couple of years, I’ve been completing an Ethnographic Landscape Study for Martin Van Buren National Historic Site in Kinderhook, NY, a national park that preserves the rural estate of America’s eighth President. 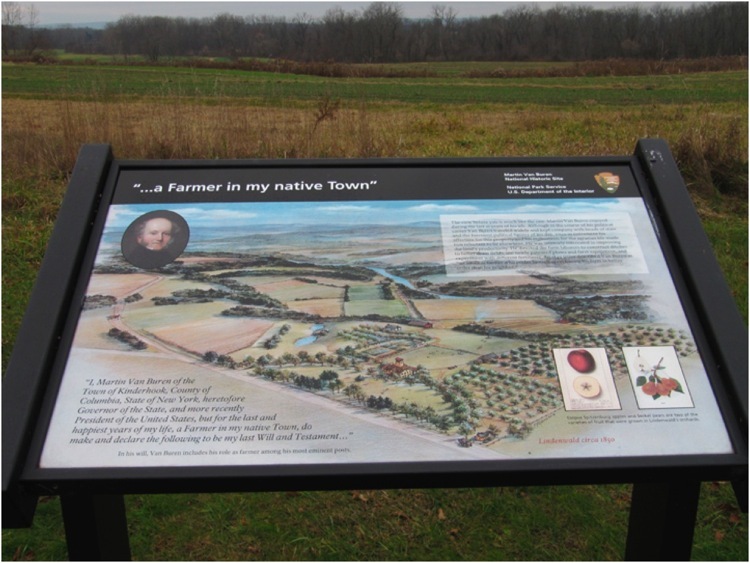 The park has recently expanded its boundaries to take in more than 200 acres of farmland that Van Buren cultivated in his post-Presidential years. The fields are now being worked by a large CSA farm, and so the park, which is used to thinking of itself as a purely historical site, is having to reenvision itself as to some extent an active participant in the working agricultural landscape of the area. The representational is beginning to overlap with the real at this site, a merger that my study was intended to clarify and support. What’s really been interesting to me is the way that this historic site and many others seem to be trembling on the verge--or are maybe just beyond it, in a few cases--of reintegrating historic and supposedly obsolete farms and farming methods into vital present-day efforts to rethink and remake our contemporary world. The past few years have seen an enormous broadening of public awareness and concern about climate change, peak oil, global capitalism, and all that connects to them (which is just about everything). And food and farming seem to be the entry-points through which people can most readily address this daunting and often depressing set of issues. Even in the few years between my initial forays into the local-food scene and today, there’s been an exponential increase in farmers markets, CSA farms, local and regional “food hubs,” and other projects that to varying degrees work to rebuild the kinds of food production and consumption that existed in most places until the mid-20th century. There’s a potentially exciting role for historic sites and organizations to play in all of this as sites of research, cultivation, and exchange. As I’ve been talking with people in the public history and museum fields about these ideas over the past couple of years, I’ve had a sense of a groundswell of interest and activism that is just beginning to build and that's casting around for ways to root itself in practice and networks of association. This blog is intended to be a node in that emerging conversation, one that I hope will help to coalesce some of the bits and pieces swirling around out there at the moment. At the same time, I hope the blog can help to explore and counter the insidious association of small-scale farming with “pastness.” The best historical inquiry helps us build knowledge about the past that isn’t colored by nostalgia, wishful thinking, or romanticism. But historic farm sites tend to be imbued with all that stuff--what I think of as the “baby lamb effect” that shapes visitors' experiences of farms that are outside the present-day agricultural economy. The rosy glow that surrounds “old tyme” farmscapes makes it harder to see the harder-edged histories of how and why we ended up with the food system we now have, and what it would take to invent (or reinvent) and sustain something different. So the big question that this blog poses is: How can historic sites help with the hard task of creating broad, historically-informed civic and policy discussions about food, farming, and all the complex issues connected to them? In other words, how can we make sure that history is at the table as we’re figuring these things out? That’s a big question, and I’m hoping some answers may emerge in the field over the next handful of years. In a more concrete sense, I’d like to ask you where you see examples of this already starting to happen. Where is history already at the table, and what good things (in addition to the list that’s started here) are underway at the intersection of historic preservation and working agriculture?